Plant Notes: This species is now placed in the genus Distimake, but was previously included in Merremia, a genus which has been redefined to include only ten species (Simões & Staples 2017). Citation DISTIMAKE AEGYPTIUS (Linnaeus) A.R. Simões & Staples	, Bot. J. Linn. So 183: 573	. 2017. Basionym: Ipomoea aegyptia Linnaeus 1753. Type: Without data (lectotype: LINN 218.35). 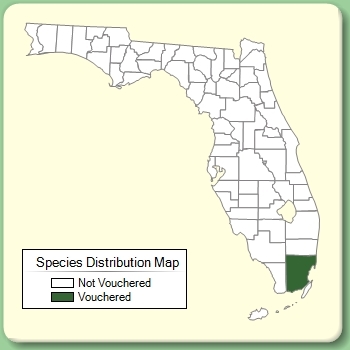 Lectotypified by D. F. Austin, in Harling & Sparre, Fl. Ecuador 16: 84. 1982. Batatas pentaphylla Batatas pentaphylla Choisy, Mém. Soc. Phys. Genève 6: 436. 1834, nom. illegit. BASIONYM: Convolvulus pentaphyllus Linnaeus 1762, nom. illegit. 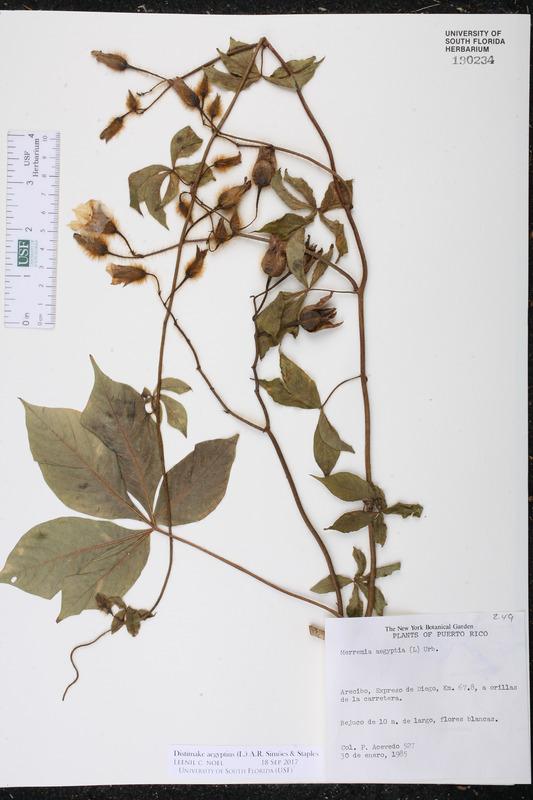 ; Ipomoea aegyptia Linnaeus 1753. Convolvulus aegyptius Convolvulus aegyptius (Linnaeus) Linnaeus, Syst. Nat., ed. 10. 923. 1759. BASIONYM: Ipomoea aegyptia Linnaeus 1753. Convolvulus pentaphyllus Convolvulus pentaphyllus Linnaeus, Sp. Pl., ed. 2. 223. 1762, nom. illegit. BASIONYM: Ipomoea aegyptia Linnaeus 1753. Ipomoea aegyptia Ipomoea aegyptia Linnaeus, Sp. Pl. 162. 1753. TYPE: Without data (lectotype: LINN 218.35). Lectotypified by D. F. Austin, in Harling & Sparre, Fl. Ecuador 16: 84. 1982. Ipomoea pentaphylla Ipomoea pentaphylla Jacquin, Collectanea 2: 297. 1789 ("1788"), nom. illegit. BASIONYM: Convolvulus pentaphyllus Linnaeus 1762, nom. illegit. 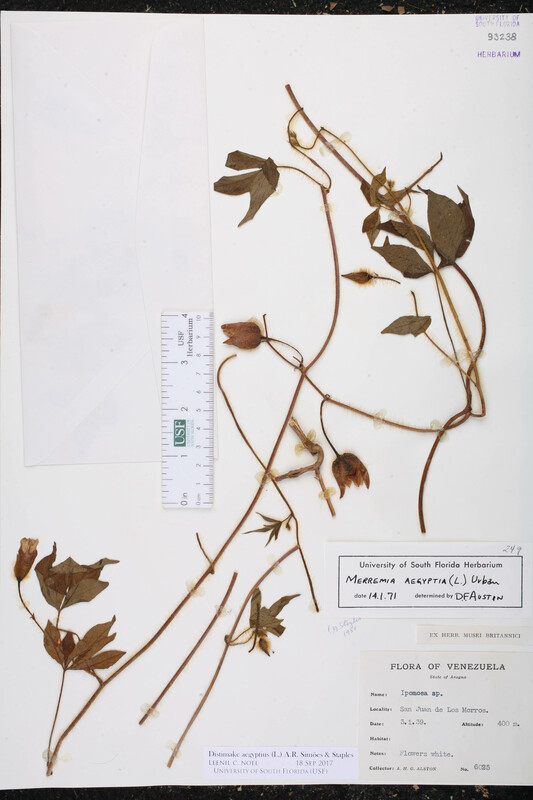 ; Ipomoea aegyptia Linnaeus 1753. Ipomoea pilosa Ipomoea pilosa Cavanilles, Icon. 4: 11. 1797, nom. illegit. et non Houttuyn 1777. BASIONYM: Ipomoea aegyptia Linnaeus 1753. Merremia aegyptia Merremia aegyptia (Linnaeus) Urban, Symb. Antill. 4: 505. 1910. 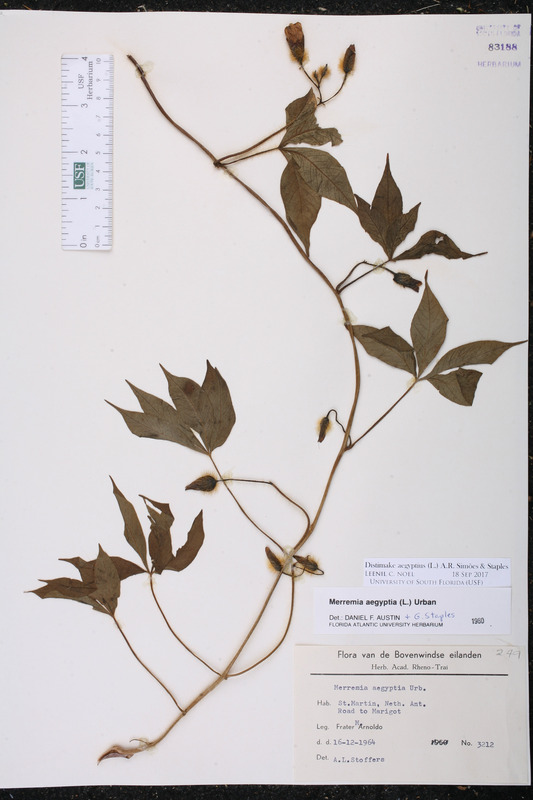 BASIONYM: Ipomoea aegyptia Linnaeus 1753. 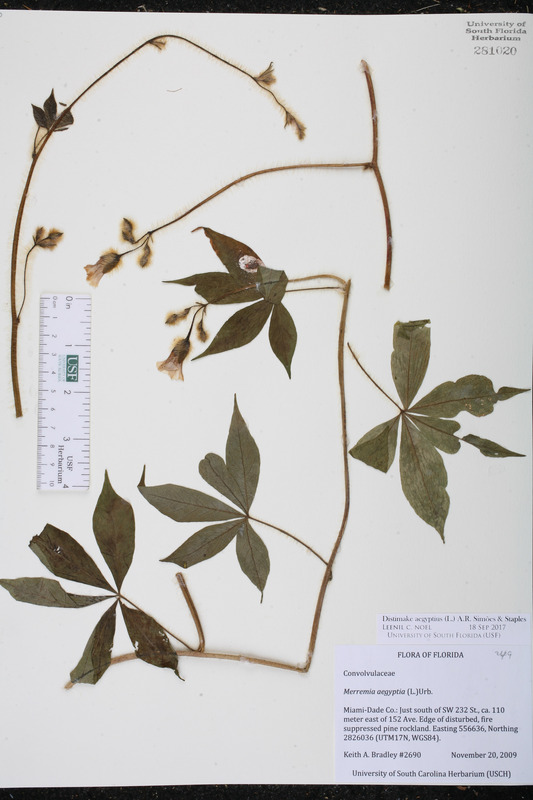 Merremia pentaphylla Merremia pentaphylla Hallier f., Bot. Jahrb. Syst. 16: 552. 1893, nom. illegit. BASIONYM: Convolvulus pentaphyllus Linnaeus 1762, nom. illegit. 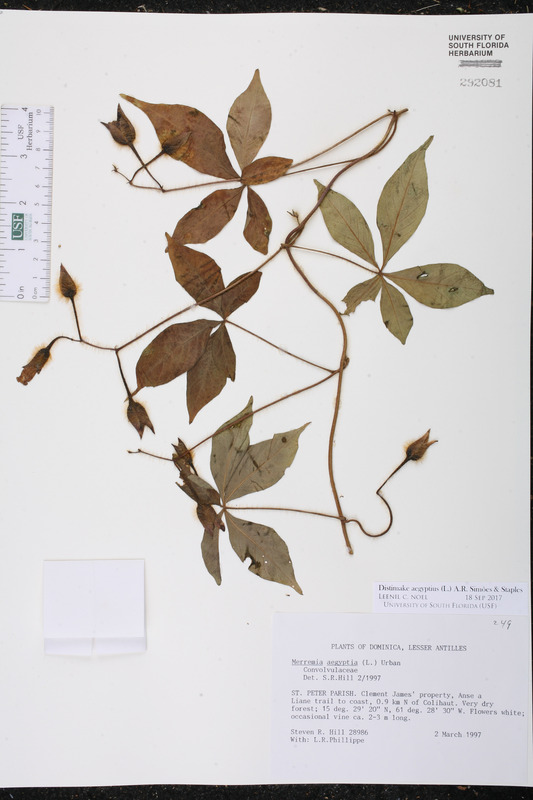 ; Ipomoea aegyptia Linnaeus 1753. Operculina aegyptia Operculina aegyptia (Linnaeus) House, Bull. Torrey Bot. Club 33: 502. 1906. 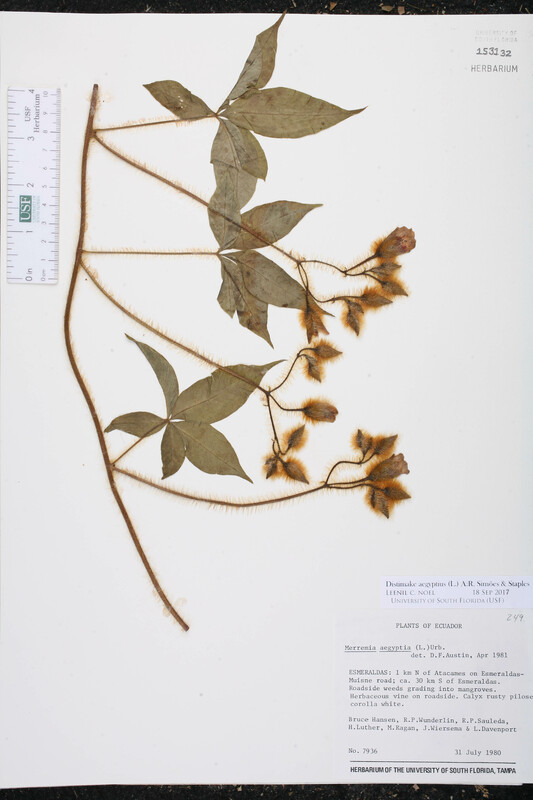 BASIONYM: Ipomoea aegyptia Linnaeus 1753. Spiranthera aegyptia Spiranthera aegyptia (Linnaeus) Roberty, Boissiera 10: 148. 1964. BASIONYM: Ipomoea aeyptia Linnaeus 1753. Spiranthera pentaphylla Spiranthera pentaphylla Bojer, Hortus Maurit. 226. 1837, nom. illegit. BASIONYM: Convolvulus pentaphyllus Linnaeus 1762, nom. illegit. 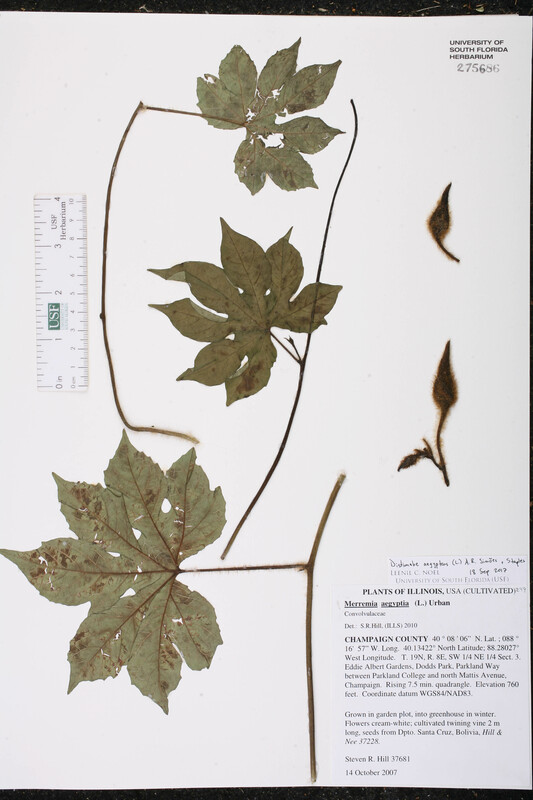 ; Ipomoea aegyptia Linnaeus 1753. Convolvulus hirsutus Convolvulus hirsutus Roxburgh, Fl. Ind., ed. 1820. 2: 65. 1824, non Marschall von Bieberstein 1808, nec Tenore 1811-1815. Convolvulus munitus Convolvulus munitus Wallich ex Wight, Bot. Misc. 2: 104. 1830. Ipomoea fulva Ipomoea fulva Bertoloni, Horti Bonon. Pl. Nov. 1826: 5. 1826. Ipomoea nemorosa Ipomoea nemorosa (Willdenow ex Roemer & Schultes) G. Don, Gen. Hist. 4: 282. 1837. BASIONYM: Convolvulus nemorosus Willdenow ex Roemer & Schultes 1819. Ipomoea polytricha Ipomoea polytricha Sweet, Hort. Brit., ed. 2. 372. 1830. BASIONYM: Convolvulus hirsutus Roxburgy 1824, non Marschall von Bieberstein 1808, nec Tenore 1811-1815. Ipomoea tortugensis Ipomoea tortugensis Peter, in Engler & Prantl, Nat. Pflanzenfam. 4(3a): 31. 1891. TYPE: GUATEMALA: Without data, 1880, Bernoulli s.n. (lectotype: GOET). Lectotypified by Staples et al., Taxon 61: 676. 2012. Merremia aegyptia var. nemorosa Merremia aegyptia (Linnaeus) Urban, var. nemorosa (Willdenow ex Roemer & Schultes) R. Knuth, Repert. Spec. Nov. Regni Veg. Beih. 43: 584. 1927. BASIONYM: Convolvulus nemorosus Willdenow ex Roemer & Schultes 1819. Merremia fulva Merremia fulva (Bertoloni) Manitz, Feddes Repert. 94: 180. 1983. 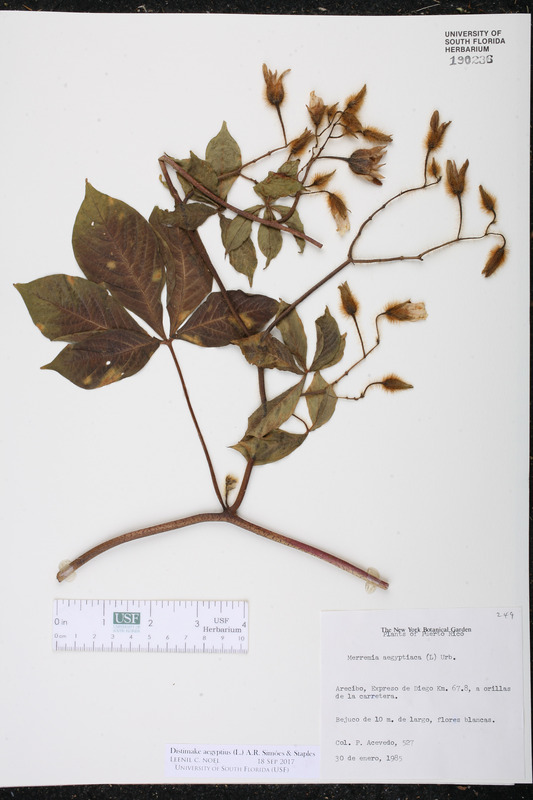 BASIONYM: Ipomoea fulva Bertoloni 1826. Merremia pentaphylla var. nemorosa Merremia pentaphylla Hallier f., var. nemorosa (Willdenow ex Roemer & Schultes) Hallier f., Jahrb. hamburg. Wiss. Anst. 16(Beih. 3): 38. 1899 ("1898"). BASIONYM: Convolvulus nemorosus Willdenow ex Roemer & Schultes 1819. USA Illinois Champaign Co. 14 Oct 2007 S. R. Hill 37681 CULTIVATED. Seeds from Dpto. Santa Cruz, Bolivia, Hill and Nee 37228.